Create, Discover, and Share the Augmented Reality App at SM City San Jose del Monte! Have you heard about ‘WallaMe?’ It is a free iOS and Android application that allows users to hide and share messages in the real world using augmented reality, where users can take photos of a surface around them, a wall perhaps, and can write, draw or add stickers on it. Augmented reality is an integration of digital information with the user’s environment in real time. Unlike the virtual reality, which creates a total artificial environment, it uses the existing environment and overlays new information on top of it. Augmented reality applications for smartphones typically include global positioning system or GPS to pinpoint the user’s location and its compass to detect device orientation. WallaMe is a new app that lets users to hide augmented reality messages in the real world. Take a picture of a wall near you, add pictures of freehand sketches and share your creation with your friends. 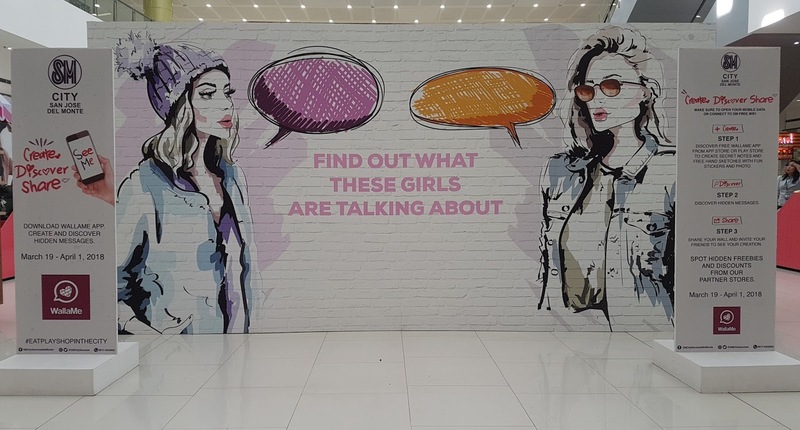 Your augmented reality wall can then be viewed by your friends when they are in the location where you created your message. WallaMe makes creating your own virtual reality easy by being creative with beautiful stencils, freehand drawing tools, geolocation, and image-sharing features. You can also add your own pictures and stickers to make beautiful digital drawings. Still curious of how ‘WallaMe’ app works? Visit SM City San Jose del Monte’s atrium at the lower ground floor. Enjoy the live image stream of our wall being created for you, our dear shoppers and customers, and get the chance to win exciting freebies and gifts! For more information and updates, you can also visit SM City San Jose del Monte’s official Facebook Page, www.facebook.com/SMSanJoseDelMonte.